Riviera Nayarit, Mexico (November 15, 2016) - The "Beyond All-Inclusive, Beyond All Compare" Grand Velas Riviera Nayarit once again shines light on contemporary Mexican art with a pop-up gallery from top Mexican artist Rosana Sanchez. At the resort now through January 10, 2017, the exhibit, entitled "Voices of Silver and Stone," features silver, gold and semi-precious stone jewelry that juxtaposes the feminine force with the sculptural tradition of Mexican indigenous people. An annual series, past fashion and art exhibitions include Benito Santos, Hoja Verde, Lyne Jewels, Alejandro Carlín, Juan Barba, and Martha Collignon. A third-generation jeweler, Rosana Sanchez is the director of the Citlali brand founded by her father in 1968. Voices of Silver and Stone is a composition of her silver creations that embody the spirit of the complex Mexican universe, metamorphosing sky, mountains, valleys, lakes, and seas into wearable art that elevates the mundane into the extraordinary. She draws upon Aztec codices, the deities of the valley of Mexico, the sacredness of the Huichol (Native Mexicans) signs, the hummingbird and the flowers it drinks from, establishing an ethos rich in the imagery of her culture and the sacred feminine. The result is utterly ethereal and delicate, yet rooted and ancient. 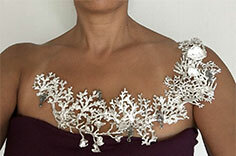 Sanchez's silvered adornments are as unique and individual as the sacred animals, insects, and flowers from which she draws inspiration. Whether it is an entwining wreath of flowers artfully draped over a shoulder as a statement necklace, or a wreath of crystal bubbles trapped in undulating angles of silver, Sanchez's work narrates a story of her past, present, and future. Voices of Silver and Stone is curated by Melín Castro, president of Melin Castro Design, a renowned Mexican architectural and interior design studio who is responsible for the design and corporate image of the five Velas Resorts among others, and Veronica López Garcia. From 2010-2015, López Garcia served in the Ministry of Culture of Guadalajara as the head of the Laboratory of Art Variety (LARVA), a forum in which she opened the exhibition space Salón Larva where she planned and curated multiple design, architecture and sculpture exhibits. Through January 10, 2017, the boutique at Grand Velas Riviera Nayarit will have original pieces of Rosana Sanchez for sale. Items such as necklaces, earrings, and bracelets range between $125 and $3,200. For more information on Grand Velas Riviera Nayarit, please call 1-888-407-4869 or visit http://vallarta.grandvelas.com/.